The Khazar theory refuses to die and every once in a while pro-(so-called)-Palestinians raise the issue in an attempt to diminish Ashkenazi Jewish claims to be returning home to Zion. If the Caucus region is home, and therefore Zion is not, then the European Jews are colonialists. This would mean that the Palestinian Arabs would have a greater claim to the land than we Jews have. That ignores, of course, the pesky problem of the Jews who never left Zion and those from Arab lands. But, let’s put that aside as we look at whether or not Ashkenazi Jews can claim to be coming home to Israel. In 1996, a group of Spanish researchers and a single Israeli Jew at the Weizmann Institute in Rehovot together published a paper (see below: the title and abstract of the paper appear as an appendix to this article). They compared the genetic make-up of Ashkenazi and non-Ashkenazi Jews in Israel and some non-Jewish Mediterranean Europeans. The genetic material studied is called a haplotype, meaning, a set of DNA variations that are generally inherited together. In this study, they used an HLA system used also at that time to determine paternity. Their results are only remarkable if you were expected anything different from what they found, and a relief even if this was what you anticipated: Ashkenazi and non-Ashkenazi Jews were more similar to each other than either of them was to any other group studied. They also share characteristics in common with non-Jewish Mediterranean peoples but are not nearly as close to any of them as they are to each other. 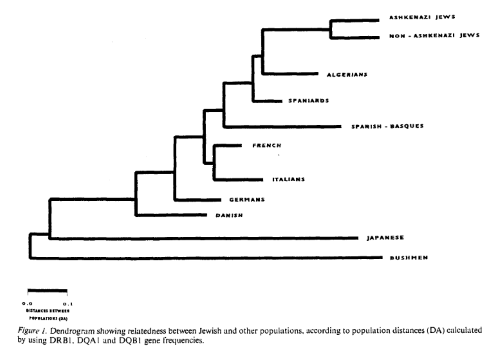 Table showing relatedness for Ashkenazi and non-Ashkenazi Jews and others. From: Martinez-Laso, et al., 1996. Also not surprising was that Ashkenazi Jews shared some characteristics with the Europeans who hosted them for centuries and that the non-Ashkenazi Jews seemed to have preserved a purer form of their Mediterranean genetic make-up. The authors conclude that Ashkenazi Jews, like their non-Ashkenazi co-religionists, originate in the Middle East. The Khazar theory has essentially be debunked, therefore, by this study and later studies uphold this finding. 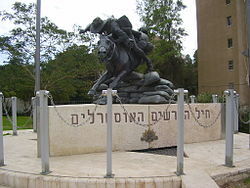 Today, it seems to be accepted by the research community that the male line of Ashkenazi ancestry originates in the Middle East. However, technological advances have improved the ability to tease out finer detail and, as a result, it is become unclear how clean a path can be ascribed regarding the matrilineal contribution to the equation. The article described in this post is a scientifically sound contribution to the debate regarding the origin of the Ashkenazi Jews. However, it turns out that this paper was only a prelude to a study published in 2001 in which the authors sought to establish the origins of the “Palestinians”. In setting the reader up for the article that will be written a few years hence, they claim that the Philistines, the sea people who occupied Gaza and the southern coast of modern Israel, are the ancestors of today’s “Palestinians”. This error takes on greater significance in their next research study, in which the single Israeli scientist is now replaced by two Palestinian Arabs. What I find hard to understand is how that single Israeli let slide such a huge error as referring to today’s “Palestinians” as yesterday’s Philistines. I examine the follow-up paper in depth in the blog named: Origin of the Palestinians. J. Martinez-Laso, E. Gazit, E. Gornez-Casado, F! Morales, N. Martinez-Quiles, M. Alvarez, J. M. Martin-Villa, V. Fernandez, A. Arnaiz-Villena. (1996). HLA DR and DQ polymorphsm in Ashkenazi and non-Ashkenazi Jews: comparison with other Mediterraneans. Tissue Antigens, 47, 63-71. Abstract: HLA-DR and DQ alleles have been detected by DNA typing in Ashkenazi and non-Ashkenazi Jews from Israel. Allele frequencies, characteristic DWDQ linkage disequilibria, population distances and their corresponding dendrograrn by using the Neighbor-Joining method were used to study relatedness between Jewish and other Mediterranean and non Mediterranean populations. Closest relatedness is observed between Ashkenazi and non-Ashkenazi Jews, and, in decreasing order, also with Algerians, Spaniards (including Spanish-Basques), French and Italians. Also, particular characteristic Central European alleles are observed in Ashkenazi Jews and Mediterranean/African alleles in non-Ashkenazi Jews. This is consistent with historical data, Jews being an ancient Mediterranean population, who have had a certain degree of admixture with their 2000-3000 years old neighbors in spite of cultural and religious traditions which have preserved identity outside Israel. Sheri Oz is a retired psychotherapist living in Israel for 38 years. Always interested in politics and international affairs, she now has time to study and write about it to her heart’s content. She often writes on her own site, Israel Diaries. anti-zionist researchers show that ashkenazis come from the middle east. anti-zionist researchers show that ashkenazis have more in common with non-ashkenazi jews than with any other people group. Well that pretty much sums up you and your anti-Zionist pals doesn’t it. I am trying to connect the dots here…..Charles Nankin notes that anti-zionist researchers, and here I assume Charles knows something about the research team at this University, discover that that Ashkanazi Jews are closer to Sephardi and Mizrachi Jews than to any other ethnic grouping and says “That’s good enough for me” and Shirlee Finn says “Well that pretty much sums up you and your anti-Zionist pals doesn’t it.”. Who is Shirlee referring to with this comment?? By this comment is Shirlee suggesting Charles is making an anti-Zionist comment…..because that would not be my interpretation. I read Charles’ comment as saying if groups that would be looking for a different solution find a solution that is positive for the integrity of the Jewish people then that is a very good outcome……..
Shirlee have I missed something here ?? On clicking on Charles’ name and linking to his FB posts I would not see Charles as someone with strong arab/filistin alignment ? Don’t know about you Larry, but I have been involved in advocacy work for Israel on the Internet, here in Australia, since its inception, and I am used to picking up on antisemitism. I thought this sounded like a case of “Jews are Khazars” in other words saying we are not Jews and we don’t come from the ME. Since doing a search I find I am wrong in my assumption and so I apologise to Charles Nankin. Charles I would appreciate it though if you could clarify what you meant and accept my apology.